Education reform, which, in Indiana has resulted in the loss of public revenue to parochial, private, and charter schools, is not a Republican-only phenomenon. Democrats have participated in the slow, steady, dismantling of public education in the U.S. Starting with No Child Left Behind (NCLB) (which is not necessarily the start of the privatization movement), the Democrats have thrown their weight behind privatization. 92% of Democrats in the U.S. House voted “Aye” for the bill, as did 94% of Democrats in the Senate. In keeping with that tradition, when it came time to replace the damaging law, the Obama administration replace the bill, with Race to the Top (RttT), which continued many of the damaging effects of NCLB. We will continue our fight for school choice until all parents can find good, safe schools for their children. To protect religious liberty we will ensure that faith-based institutions, especially those that are vital parts of underserved neighborhoods, do not face discrimination by government. I assume by their behavior that to Indiana Republicans, “discrimination by government” means refusing to give private religious schools public tax dollars. So, to rectify that, nearly a half billion dollars of public tax revenue has been spent on Indiana vouchers since 2011, and more than $150 million in the current 2017-2018 school year. Democrats weren’t quite as “free-market” oriented, opting for “public” charter schools and saying nothing about school vouchers. Democrats are committed to providing parents with high-quality public school options and expanding these options for low-income youth. We support democratically governed, great neighborhood public schools and high-quality public charter schools, and we will help them disseminate best practices to other school leaders and educators. Democrats oppose for-profit charter schools focused on making a profit off of public resources. K-12 education was rarely if ever mentioned during any of the candidate debates. 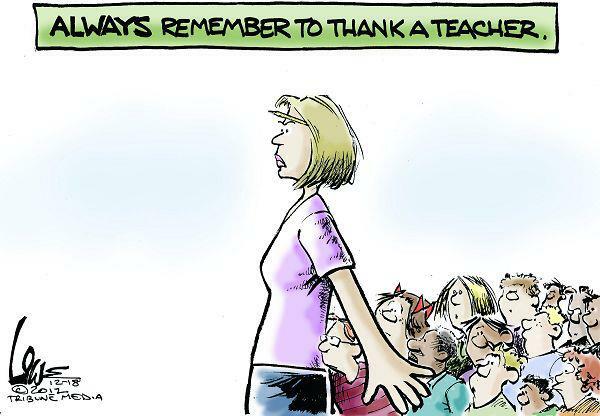 Isn’t it time for teachers in Indiana to speak up? Average teacher salaries in Indiana have declined by over 15 percent in the past 15 years after adjusting for inflation. That’s according to an interactive analysis produced last week by Alvin Chang of Vox, drawing on data from the National Education Association. This is what happens when you focus on symptoms rather than causes. We need better policing of who can get and who owns guns in our society…better limitations on the kind of guns, sizes of magazines, and quantities of ammunition that people are allowed to buy…and better support services for people in need. “The decision to funnel more money into the militarization of our schools and policing of young people is really problematic,” Kaitlin Banner, deputy project director at the liberal nonprofit Advancement Project, told HuffPost. When states or the federal government encourage school districts to increase the presence of police in the schools, the officers end up mostly in schools that serve children of color, who bear the brunt of the tougher security policies, she said. “We’re similarly concerned about bringing more guns and weapons into the school environment,” Banner said. The POTUS realized that we ought to raise the age for gun purchases (we already have a higher age for handguns, why not for rifles?). Then – NRA – and he changed his mind. The NRA is a tool of the gun manufacturing industry interested only in the number of guns sold, not the safety of American citizens. The White House on Sunday vowed to help provide “rigorous firearms training” to some schoolteachers and formally endorsed a bill to tighten the federal background checks system, but backed off President Donald Trump’s earlier call to raise the minimum age to purchase some guns to 21 years old from 18 years old. Responding directly to last month’s gun massacre at a Florida high school, the administration rolled out a series of policy proposals that focus largely on mental health and school safety initiatives. 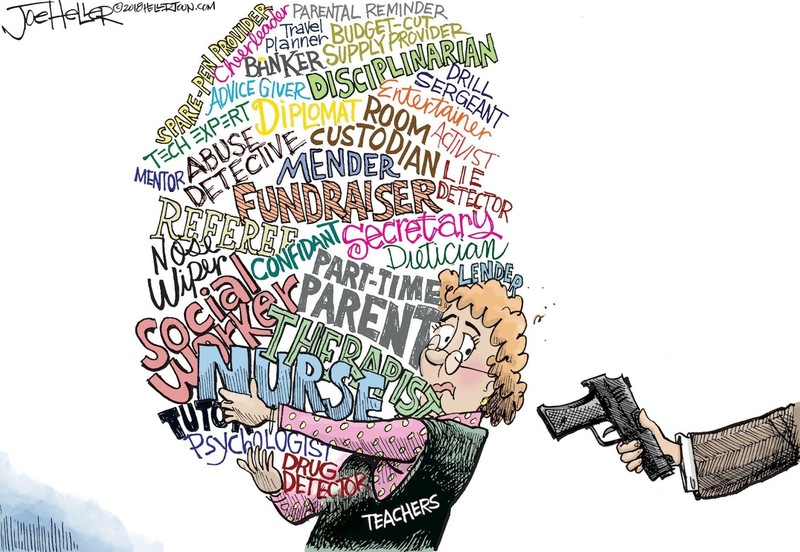 The idea of arming some teachers has been controversial and has drawn sharp opposition from the National Education Association, the country’s largest teachers lobby, among other groups. 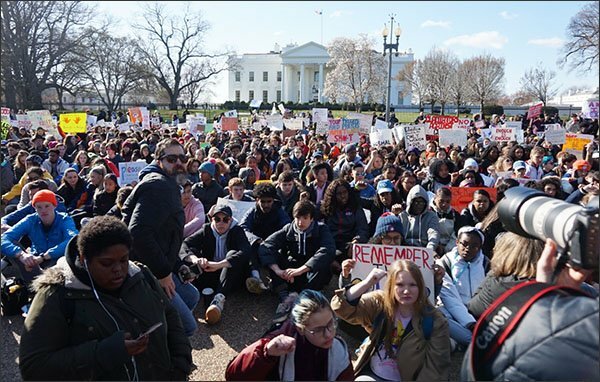 Many of the student survivors have urged Washington to toughen restrictions on gun purchases, but such measures are fiercely opposed by the National Rifle Association, and the Trump plan does not include any substantial changes to gun laws. In case you missed this…vouchers don’t work to improve education and are simply a way to transfer public funds into private and religious hands. This report is from 2017. School “failure” is almost always the result of high poverty, lack of opportunities, and out-of-school factors. 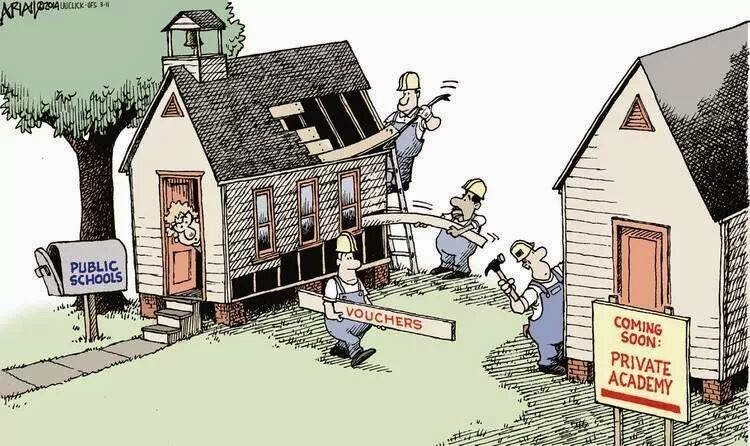 Vouchers can’t solve those issues. Here are two excellent editorials about Indiana’s ever-expanding, wide-ranging voucher plan. Our state gives money to private schools which do not have to follow the same rules as public schools giving them an advantage. Yet, when they still “fail” the state “waives” their responsibility. Indiana’s voucher plan was originally sold as a way to help poor children “escape from failing schools.” No longer. More and more middle income parents are using vouchers without trying public schools. It has become an entitlement program for religion. Indiana’s school voucher system continues to grow, with the state spending $153 million for the 2017-18 academic year – a record for the program – to help more than 35,000 students attend private schools. A report on the 7-year-old voucher program – also known as school choice – shows a 3.4 percent increase over the previous year in the number of students taking part. It also shows the cost to Indiana public schools continues to rise. State numbers mirror data from Allen County, where voucher numbers are up in three of the county’s four public school districts. Allen County has 6,215 voucher students, up from 6,209 last year. The estimated cost to public school districts in the county rose by more than $500,000 to $25.8 million in 2017, according to the report.